Ryan’s brother and sister-in-law came over for tea this evening, to catch up and so Ryan and his brother could watch the Manchester United Vs. Liverpool game together. They both support different teams – Ryan supports Manchester United and his brother supports Liverpool. There was a lot of shouting at the tv and arguements over referee decisions(! ), I admit watching them both literally on the edge of their seats was quite funny. The teams drew 1-1. For tea we made vegetarian bean burritos as both his brother and sister-in-law are vegetarians. It was my first time trying burritos without any meat and they were delicious! Ryan also cooked up a little cajun chicken for me and him to have with ours if we chose to. For the burritos, you will need. 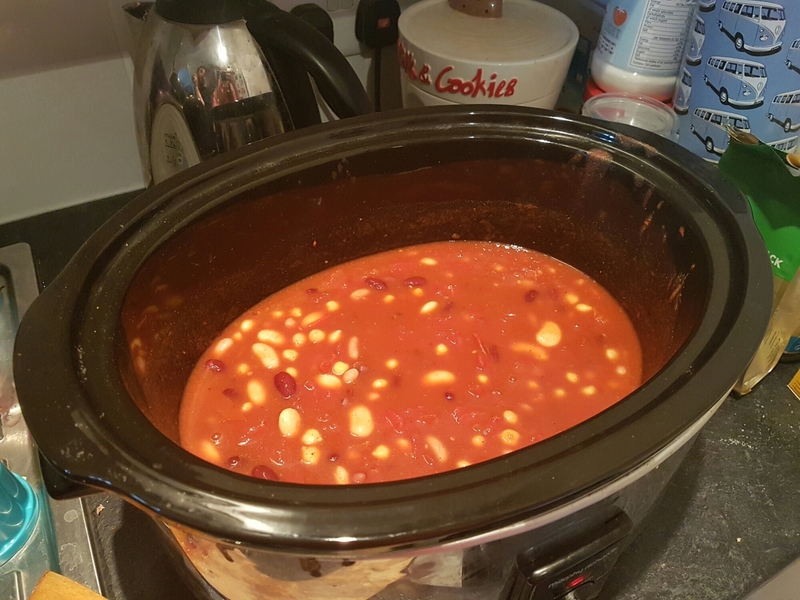 There are two methods you can use to make these, the first is with a slow cooker – my mum bought me mine years ago, brand new, at a table top sale for £5! I love it and we use it frequently- and the second is with a pan. Add the 2 tins of tomatoes and chilli powder to your slow cooker. Cook on low heat for 2 and 1/2 hours before adding in the beans and chicken peas along with the cup of water. Stir occasionally. Continue to cook on low for another 2 and 1/2 hours, stirring occasionally. If you don’t have a slow cooker, you can use the following, alternate method. Drain the beans and add to a sauce pan, stir well. Add the tomatoes and chilli powder mix with a cup of cold water, mix well and leave to simmer. The aim is to evaporate most of the water. Once the chilli mixture is cooked (using one of the above methods), microwave the tortillas on full power for 35-40 seconds or heat in the oven following the pack instructions. We served ours with the grated cheese and store bought guacamole, salsa and sour cream.